OK, so Draco's stinking drunk after a good/bad night out, depending on your interpretation, and Ron and Harry end up making sure that he gets home safe. Also Harry maybe has a thing for a certain blonde Slytherin. Only due to the aforementioned drunk-as-f**k Malfoy, Ron leaves any potential meddling for another time. For now he's just enjoying the f**k outta the awkwardness! This fic is a lot of fun, kinda fluffy, and responsible about how to deal with a drunk friend. Have you ever had to deal with a drunk friend? What sort of fanfiction would you like me to feature in 2019? 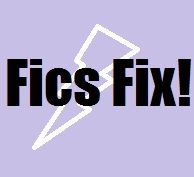 Friday Fics Fix - Draco the Writer. Harry the Reader. Ha, they're all growed-up in this fic, but I totally get what you mean. Good friends are awesome!